Products containing alcohol may not be given to persons under the legal age. By registering / ordering with date of birth, you confirm that you have the required minimum age. Please handle alcohol responsibly. Age control on delivery! Product information "Krombacher Pils Freshness Keg, 5 liters 4.8% vol party keg"
You have never tapped that easily!Discover the Zapf-Sensation, exclusive from Krombacher: Whether at home or on the move in the countryside - the new deposit-free 5l keg with integrated Easy-Zapf system allows you to tap anywhere professionally without the need for an additional tap!After tapping, enjoy fresh Pilsneruss for up to 30 days.With practical carrying handle, the ideal companion for on the go. 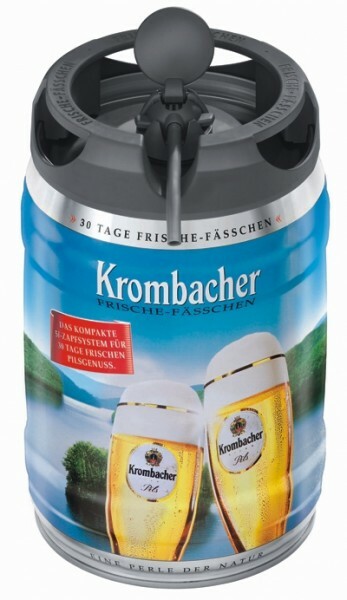 Related links to "Krombacher Pils Freshness Keg, 5 liters 4.8% vol party keg"
comment "Krombacher Pils Freshness Keg, 5 liters 4.8% vol party keg"
Customer evaluation for "Krombacher Pils Freshness Keg, 5 liters 4.8% vol party keg"
4 x Heineken beer barrel 5L DraughtKeg 5% vol.